Into a sauté pan over medium-high heat, add about 1-2 tablespoons of lard. Add the ginger, onions and garlic and stir for a minute or so. Add the tampalen. Add the chopped chilies and stir for a few seconds more. Because I had some teeny tiny tomatoes, I added a half-handful to the pan and stirred that around (I am not sure if tomatoes are often included in other bangus sisigs) then added the chopped up fish. Season with some soy sauce (and/or Worcestershire or even oyster sauce if you like) and a few squeezes of fresh kalamansi juice and some cracked black pepper. Others might use mayonnaise(?!) (for creaminess?) and/or a raw egg but I decided to do without. 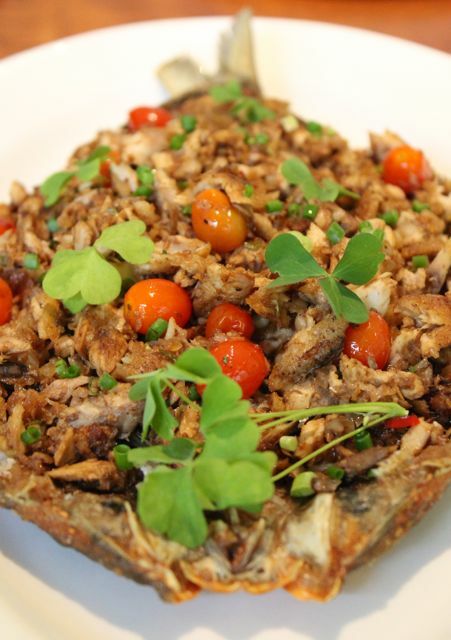 Sprinkle with some chopped green onions and place the sisig onto the fried fish skin on a serving platter. 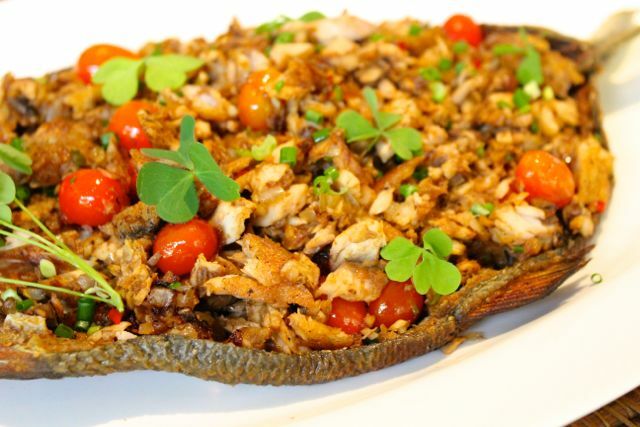 I garnished with some wild sorrel which has a slightly sour or tart flavor perfect with the sisig and sat down to lunch. Feeds 2-3 with other dishes for the meal. It was delicious! Crispy, moist, spicy, tasty and perfect with a LOT of steamed rice. The tomatoes may not be typical, but they added nice warm bursts of moisture and flavor. This is a keeper! A fine recipe to greet me this morning: ” a combination of “chills”,( if you didn”t mean “kilig”, might as well! :) onions, ginger, garlic, etc”. 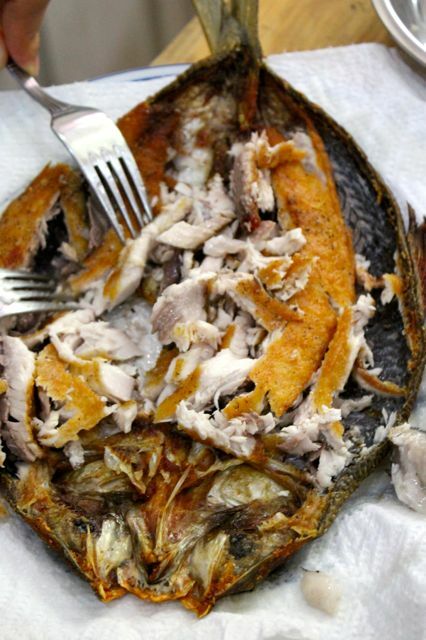 Sounds delicious, looks beautiful and above all, mandates to somebody else the pesky duty of gleaning the fine fish bones out of the way. I won’t differ with you in leaving out the mayonnaise or coddled egg. Probably a bad habit anyway, similar to Americans’ penchant for dribbling ranch dressing on everything. @Connie C, just finished listening to the last episode. Finally answered a persistent question about my first cologne (right after Old Spice), Roger et Galet’s Farina. Footloose: Ahh cologne! I have been looking for body scents/fresheners especially in this hot humid tropical weather. Scents are such a personal thing. Wonder if R&G Farina might be the scent for me. I have tried and tried citrusy and mild floral ones and they simply don’t work with my body oils regardless of price. @Connie C, How about just taking it from the ancient Romans who considered women smelled nice when they did not smell of anything. Mulier bene olet dum nihil olet. Yes Footloose…I don’t know if nice for the ancient Romans meant not smelling of anything but themselves. …..and for the French and most Europeans…. au naturel. hahaha! a cousin says mexican food always smells to him like funky armpits!